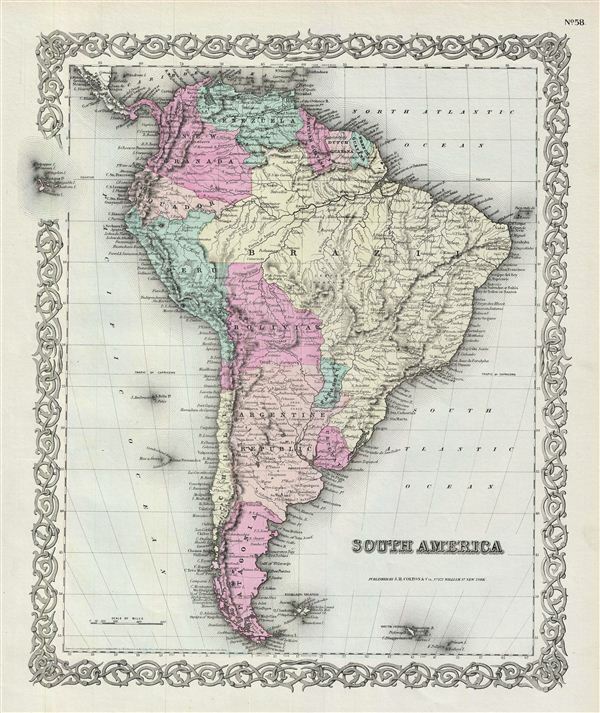 A beautiful 1855 first edition example of Colton's map of South America. Covers the entire continent from the Caribbean to Tierra del Fuego and from the Pacific to the Atlantic. Includes the Galapagos, Juan Fernandez, Falkland and South Georgia island groups. Depicts the continent in impressive detail – especially the interior, which at the time was largely unknown. Shows Bolivia with an outlet to the Sea and Patagonia as separate from the Argentine Republic and Chile. This map also identifies various cities, towns, forts, rivers, rapids, mountain passes, fords, and an assortment of additional topographical details. Map is hand colored in pink, green, yellow and blue pastels to define national and regional boundaries. Surrounded by Colton's typical spiral motif border. Dated and copyrighted to J. H. Colton, 1855. Published from Colton's 172 William Street Office in New York City. Issued as page no. 58 in volume 1 of Colton's 1856 Atlas of the World. Rumsey 0149.063 (1856 edition). Phillips (Atlases) 816.